Built in1988 by the Chung Hwa (CHB) Boatyard, regarded as one of Taiwan's most experience yards, she is a double cabin sundeck design with a full flybridge, semi-displacement hull, long keel and a beautifully crafted teak interior. This CHB is known for her popular sundeck and cockpit configuration. She has the perfect layout for extended cruising or liveaboard, yet easy enough to operate to take in an evening sunset.From the stern you can board on the swim step through the transom door into a large cockpit.A short ladder accesses the fully enclosed sundeck. Up to the flybridge or down to the large comfortable salon.The galley is down to port with a head to starboard.The V-berth cabin is designed with bunks, a dressing table, and a small seat.The aft master cabin has a walk around queenberth and private head.Storage everywhere.Ready for the change of command, “Outnumbered” is a must to see. United Yacht Sales New Jersey would love to guide you through a personal showing of this 44' Chb Cpmy 1988. 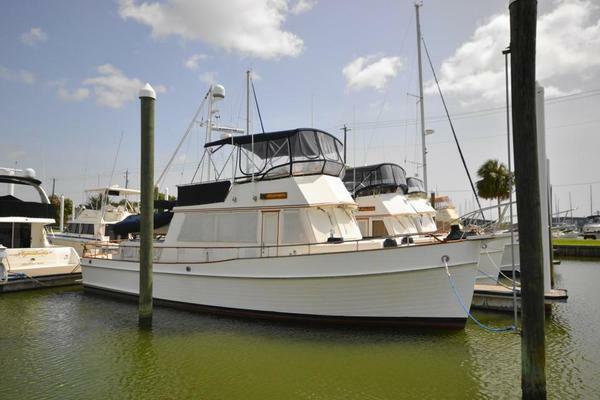 This yacht for sale is located in Stuart, Florida and priced at $129,865. For a showing please contact us by filling out the form on this page and we will get back to you shortly! Entering the yacht from her large swim platform we come through a transom gate to the fishing cockpit. Up three steps to the spacious furnished sundeck with a hardtop. The bar andsinkare forward on port. The wing doors port and starboard make this a comfortable area for relaxing in warm or cooler weather. Enter the flying bridge amidships up three steps to the spacious bridge featuring helm chair and ample additional seating with storage below. Enter the salon down three steps from the sundeck. A large sofa with storage below is on port and a chair and electrical panel is on starboard. Aft is the owner’s suite with an ensuite head, and shower. Down from the salon is the galley to port and raised dinette to starboard. The engine room access is below the galley stairs and is easily entered between the engines. Further forward is the guest stateroom with ensuite head. The beds are upper and lower with the upper bunk pulling out to make a large double bed. The large foredeck is easily accessed bythe wing doors port and starboard from the sundeck. Down 3 steps from the Salon, the galley is on the starboard side.It has an opening port, Stainless sink, 2 burner cooktop, and lots of cabinets and workspace.Across is a separate dinette.Natural light is provided from the windshield above. The large salon is spacious and airy with plenty of light. It is finished with beautiful teak woodwork and has an entertainment center, Flat-screen TV, and a comfortable customsofa and chair. Aft is the owner’s suite with an ensuite head, and shower. The washer/dryer combo is in the passageway to the aft cabin. The forward cabin has up and down bunks.The upperpullsout to make a double.This cabin also has a built-in vanity, hanging locker, drawers, opening ports, and 12-volt lighting.The guest head is aft to starboard. The deck area is easy to maneuver about with hand and bow rails. All hardware is of excellent quality and equipment well maintained. COCKPIT:The cockpit is large and ready for the angler or cruising. A centerline ladder provides sundeck access. There is a transom door to the swim platform to port. The center of command is the Flybridge which is larger than most and provides excellent visibility and provides plenty of seating for comfortable cruising. The helm area features a nice helm console and adjustable helm seat. There is a full array of electronics for the Captain which assures confident and safe passage. “Outnumbered” is powered with the preferable 305 HP Volvo engines. The engines and mechanical systems are all in very good condition. “Outnumbered” is a very well maintained 44’CHB CPMY that has been upgraded and afforded the best of care by her knowledgeable owner. She is seriously for sale and awaits the change of command.